We all want to save money and know there are so many ways to do it. In recent years, couponing has made a comeback in a new form. Couponing has evolved in the digital age and it’s been gaining popularity in recent years since you no longer have to sit and clip. Coupon apps are now making it possible to search coupons and local Groupon daily deals while shopping. The convenience of these apps have people downloading them left and right, but which ones are the best? Here is a rundown of the best coupon apps for iPhone and in Google Play. Never pay full price again! 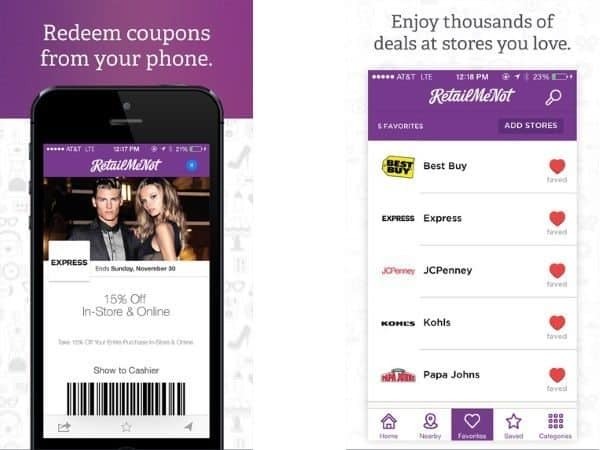 RetailMeNot offers discount and coupons in one app. Over 50,000 retailers are featured on the RetailMeNot app from national to local businesses, including restaurants. Users have the ability to save their favorite places to shop, get location-based sales when you are near a store, and sign up for notifications of new coupons and offers. Simple to use, RetailMenot is very user friendly and makes couponing a breeze. 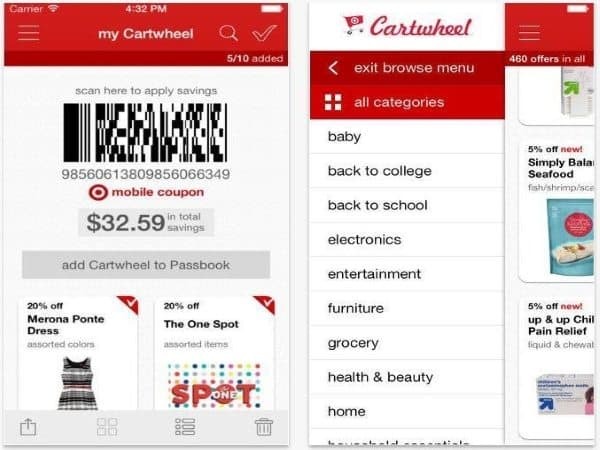 Not all coupon and discount apps are store specific, so it’s worth having one or two that are meant for one store in order to get their specialized deals you can’t find anywhere else; CartWheel from Target is one of those. From 5% to 50%, users can save big in-store at the register. All you have to do is choose your offer, show your mobile barcode at checkout, and save! Offers can be used multiple times and can even be stacked on top of coupons, sales, or other discounts such as your Target REDcard. Additionally, the more you use CartWheel, the more deals you unlock. Tired of signing up for store discounts and having to carry bulky keys? There’s an app for that! The KeyRing app allows you to input your store loyalty cards, eliminating the need for those plastic annoyances that weigh your key ring down. Not only is KeyRing good for lightening your loyalty card load, users also have access to even more coupons, weekly sales, and you can share your card with family and friends to share the savings. With a simple enough name, Coupons.com’s app is just as simple to use, but the features are more than you might imagine. 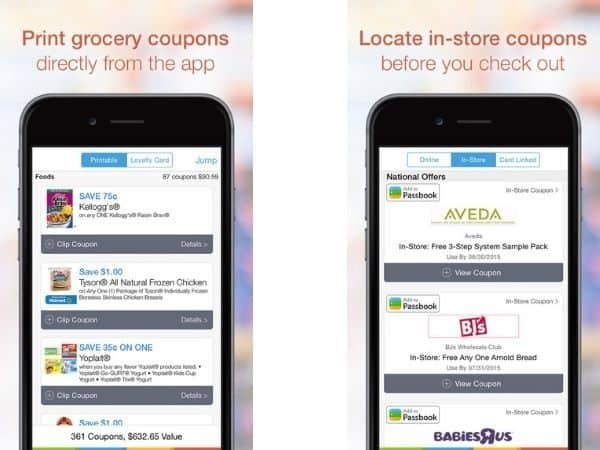 Not only can you get coupons on your smartphone, you can access thousands of codes, promos, and other coupons through the app. You can copy/paste as well as drag/drop or even print coupons. Like KeyRing, you can hook up your loyalty cards to get extra savings and like RetailMeNot, you can get nearby store info in notifications right when you need them. Favado, featured on the Today Show, Forbes, and USA Today is a huge innovator when it comes to price comparison shopping. Users compare prices across local stores and can choose the best deals on the products they buy most. Choose up to 10 stores at a time to find the lowest price, add the item to your grocery list (which sorts them by store for you) and get additional info one which coupons will save you even more! 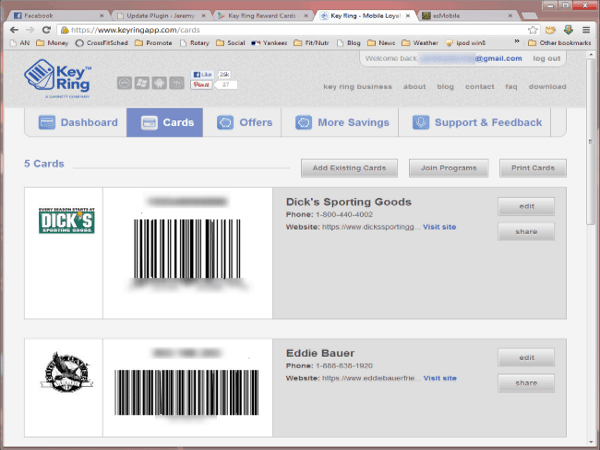 Favado gives you exact prices and directions how to stack coupons to maximize savings. 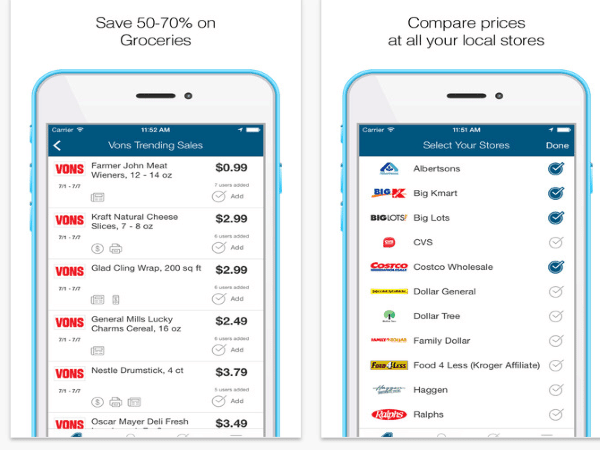 This no-frills app is one of the best free couponing app on the market today.